After viewing a preview clip from the upcoming Steve Jobs biopic, "jOBS," Apple co-founder Steve Wozniak said the filmmakers got it all wrong. "What I saw was just so far from anything that really happened or said in those days," Wozniak told "Good Morning America." The 62-year-old Wozniak, who is portrayed in the film by actor Josh Gad, formed Apple Computer with Jobs in 1976. 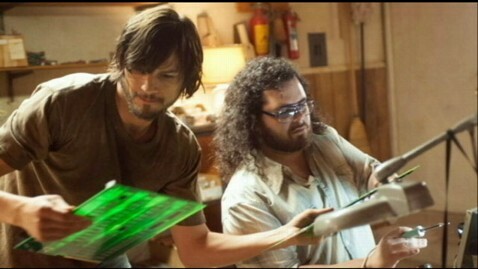 The film attempts to portray the defining years of Steve Jobs' life. Jobs died on Oct. 5, 2011. He was 56. In the clip, Jobs and Wozniak are arguing over the merits of building a personal computer for home use. Wozniak said the first thing that struck him as inaccurate were the personalities. Ashton Kutcher portrays Jobs as a tech visionary, a role Jobs didn't truly embrace until much later in life, according to Wozniak. "As far as the personalities that were in that scene, ha ha, this was just ridiculous," he said. "Steve Jobs as some sort of overseeing … 'omg, I'm the father of society' … No, he didn't act like that at all." Another thing Wozniak said the film got wrong was the wardrobe. "The portrayal in the clip was a little absurd… I never wore a tie or looked like a professional," he said. "And in that scene I kind of looked like a real professional…"
So what would Steve Jobs think of his portrayal? "I think he would have been a little offended and embarrassed by it just like myself… I think he would say that was, you know, a little bit too phony," Wozniak said. In response to Wozniak's critique, the film's publicist Amanda Lundberg told Entertainment Weekly that "The film is not a documentary, nor is it meant to be a blow by blow, word for word account of all conversations and events. The filmmakers have tremendous admiration and respect for Wozniak and all those that are portrayed in the film, and did extensive research in an effort to make an entertaining, accurate film that captures the essence and story of Steve Jobs and those that built Apple with him." Wozniak said he just watched one scene and the entire film might be great. The movie, which is being released by Open Road Films and Five Star Feature Films, premiered at the Sundance Film Festival on Friday. The film is set to be released on April 19 - the 37th anniversary of the founding of Apple Computer. ABC News' John Muller, Joanna Stern and The Associated Press contributed to this report.